No problem. Have fun, and Merry Holidays to you and yours! aaaaaaaa, why do you have to end on a cliff-hanger like that?! Ah, I’m probably going to forget about it in that time. After the reduced schedule, too… Oh well, I expect I’ll come back to it eventually, and that will be fun enough. Turns out I did forget. Until now. Please don’t be permanent hiatus? Have no fear, we are definitely not on permanent hiatus! Volume six has started, even if no one but Paul, Brandon, and I have seen it. That is good to hear. I hope to see it soon! what happened???? are they going to do the comic or not??????? 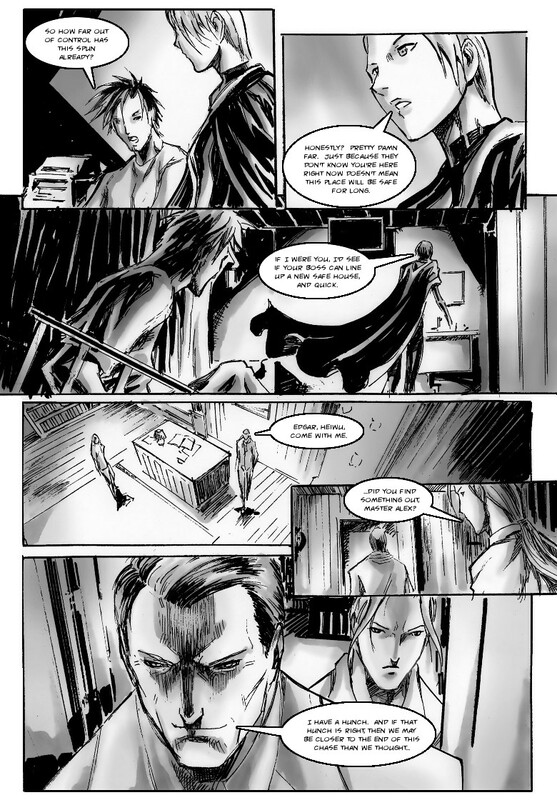 We are still at work on Zokusho–the script for the next issue (looking to be about 40 pages) is about 95% complete, a lot of the pencil pages are done, and about 1/3-1/2 of those pencil pages have already been inked. What is currently holding us up is that we’ve been offered an opportunity to pitch a series for the online seinen manga anthology, Saturday PM. If this goes well, it will be our first opportunity to do comics at a professional level, and we’re trying to bring our A-game as we put together our presentation. Once we know how that is proceeding, we’ll re-establish an update schedule that can be managed with whatever our new workload turns out to be. Seconded. That said, this is professional-grade work – I’ve certainly seen worse get published – and I kinda wish you’d spend more effort marketing it. Also, be careful about your contract. Anyway, hope to see this come back soon. Is this regenerating, or do I need to find a slab and a thunderstorm? (pokes page with standard issue 11 foot pole) is it dead? April was a while ago with no update since 90 ish precent penciled and 1/3 inked. Can we get a fresh update on the status of your amazing work?